Notes: Architects: Machinery Hall, Bldg. #2 - Henry Pettit & Joseph M. Wilson; World's Ticket Office, Bldg. #84 - H.J. Schwarzmann; Pennsylvania Railroad Office, Bldg. #113 - J.M. Wilson; Judge's Hall, Bldg. #109 - H.J. Schwarzmann & Hugh Kafka; Memorial Hall/Art Gallery, Bldg. #101 - H.J. Schwarzmann; Main Exhibition Building, Bldg. #1 - Henry Pettit & Joseph M. Wilson. Notes: Exterior view of buildings lining Republic Avenue. On the road in front is a horse and cart and railroad tracks. 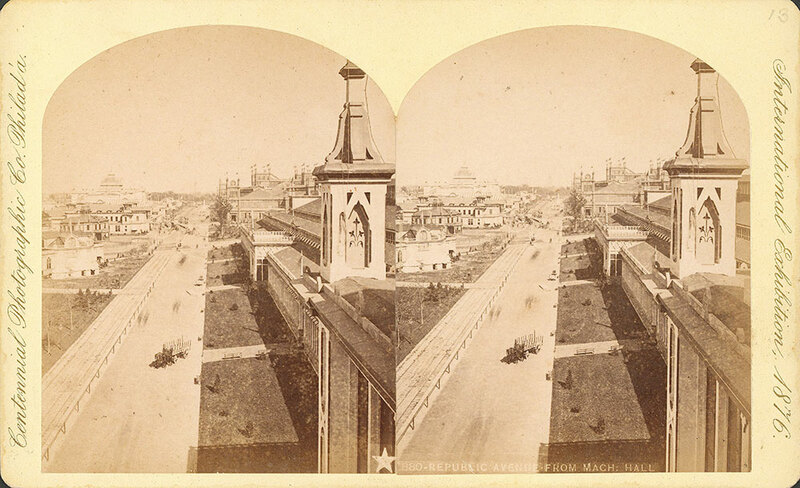 Notes: Title on label: Republic Avenue from Mach: Hall.